He's as big as Lance Armstrong's exploits, as meaty as Alex Rodriguez's arrogance and he too has been dethroned due to doping. The three competitors have lots in common but the biggest difference is that the latter is this year's Calgary Stampede grand champion steer. Yes, the Calgary Stampede's drug policy has claimed its first champion. 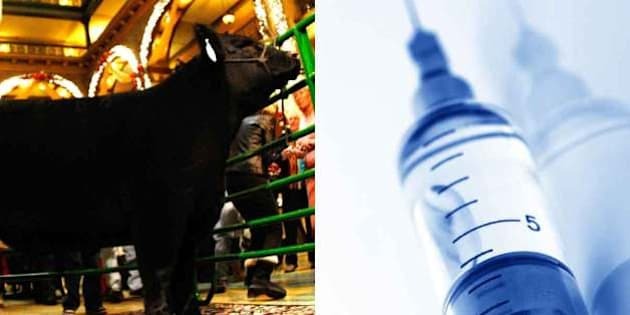 The steer, which is owned by Royden Anderson and Riley Chalack, had his title stripped after a substance, which the Stampede did not disclose, was found during a standard blood test. "We are committed to animal care and welfare, and we will continue to enhance rules, regulations and policies related to animal health and safety," says Max Fritz, Director of Western Events and Agriculture. "As part of this responsibility, we reserve the right to carry out drug testing. In the case of the steer competition, we felt it was important to test both the Grand Champion and the Reserve Grand Champion for the integrity of this competition." This is the first time a steer has been disqualified due to doping. But the owners of the dethroned steer say they will appeal the decision and told the Calgary Herald what the animal was on was Banamine, a pain killer they were told to put the steer on after he suffered an injury eight months ago. Chalack told the Herald they administered the anti-inflammatory the night before the competition after asking a Stampede vet. “We asked him if we could use a different kind of anti-inflammatory, and he said ‘No, we want you to use Banamine,’” Chalack said. The title of Calgary Stampede grand champion steer carries with it a $10,000 purse.